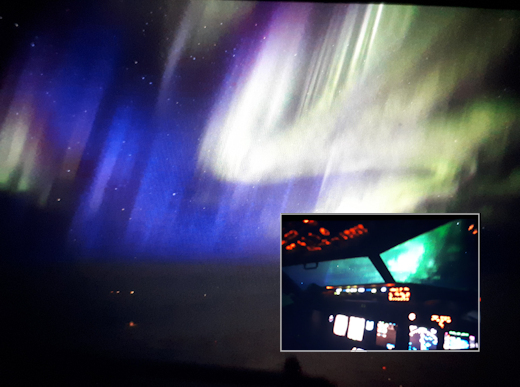 April 26, 2018: For the past 4 years, Spaceweather.com and Earth to Sky Calculus have been flying radiation sensors onboard airplanes to map the distribution of cosmic rays around our planet. Our database currently contains more than 17,000 GPS-tagged radiation measurements spanning 5 continents and 43,000 feet of altitude. 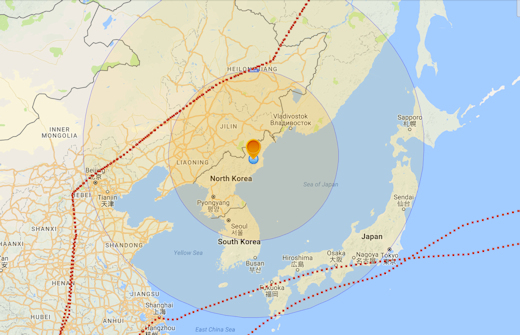 Yesterday, we realized we could use this database to investigate a current event–namely, the possibility of a radiation leak from North Korea. North Korea recently surprised observers by announcing a suspension of its underground nuclear testing program. Geologists in China quickly offered an explanation: Mount Mantap, which sits atop of the test site, had collapsed. The mountain crumbled in Sept. 2017 minutes after the North Korean regime exploded a 100 kiloton prototype weapon. According to the South China Morning Post, the China Earthquake Administration believes the collapse may have created a “chimney” that allows the escape of radioactive materials. Is there any sign of radioactivity in the air space around North Korea? Our database contains four flights near the Korean Peninsula–two in March 2016 (before the collapse), and two more in Feb. 2018 (after the collapse). These are shown in the map, below, where orange circles of 350 miles and 700 miles radius are centered on nuclear test site. 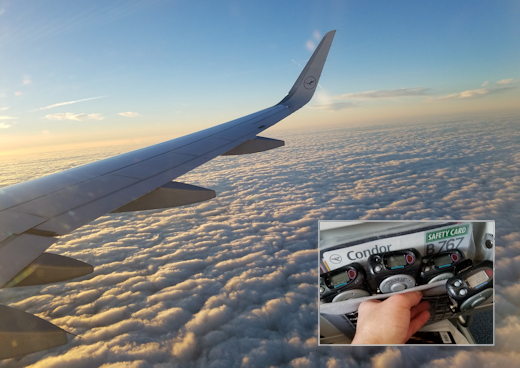 During each flight we sampled X-rays and gamma-rays in the energy range 10 keV to 20 MeV at one minute intervals, accumulating more than 600 data points. Low energy X-rays have been used in the past to trace radioactive fallout from atomic tests, so our measurements may have some bearing on the question. Above: Red dots show where we have collected radiation data in airspace near N. Korea. And the answer is …. no. Comparing radiation levels pre-collapse vs. post-collapse, we found no significant difference. For instance, radiation dose rates in March 2016 at 31,500 feet were 0.9 uGy/hr (18 times the natural rate at sea level). Radiation dose rates in February 2018 at the same altitude were 1.0 uGy/hr (20 times sea level), a slight increase within the uncertainty of the measurements. If radiation is leaking from the collapsed mountain site, it is not having a detectable effect on aviation over neighboring countries. April 20, 2018: An interplanetary shock wave hit Earth’s magnetic field on April 19th around 23:50 UT. When the disturbance arrived, the density of solar wind flowing around our planet abruptly quadrupled and a crack opened in Earth’s magnetic field. 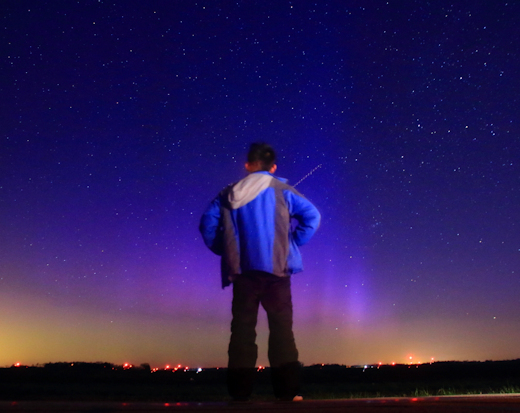 The resulting G2-class geomagnetic storm sparked unusual “electric blue” auroras. Auroras are usually green–a sign of oxygen. 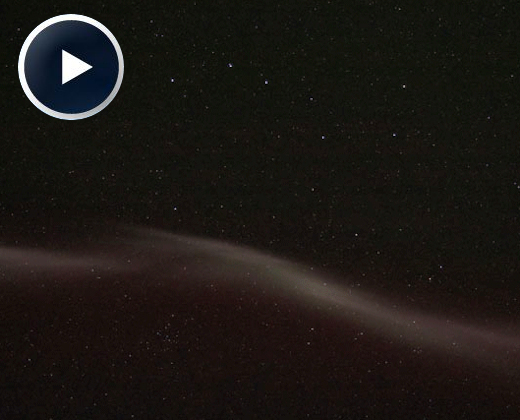 Rare blue auroras are caused by nitrogen molecules. Energetic particles striking N2+ at the upper limits of Earth’s atmosphere can produce an azure glow during intense geomagnetic storms. What is an interplanetary shock wave? It is a supersonic disturbance in the gaseous material of the solar wind. These waves are usually delivered by coronal mass ejections (CMEs). Indeed, this one might have been a minor CME that left the sun unrecognized earlier this week. Alternately, it might have been an unusually sharp co-rotating interaction region (CIR). CIRs are transition zones between slow- and fast-moving streams of solar wind. 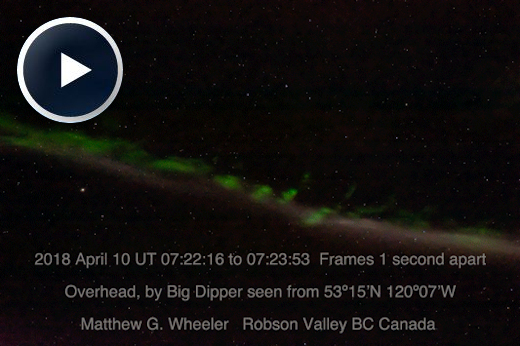 They contain plasma density gradients and magnetic fields that often do a good job sparking auroras. STEVE may look like an aurora, but it is not. For one thing, it is soft purple, not green like typical auroras. And it has its own special form–tightly collimated into a narrow ribbon that can bisect the entire sky. Researchers are only beginning to understand the phenomenon–aided by a chance encounter between STEVE and a European satellite a few years ago. In situ measurements revealed that STEVE is a hot (3000 degrees C) ribbon of ionized gas slicing through Earth’s upper atmosphere some 300 km above the ground. It appears unpredictably during some, but not all, geomagnetic storms.